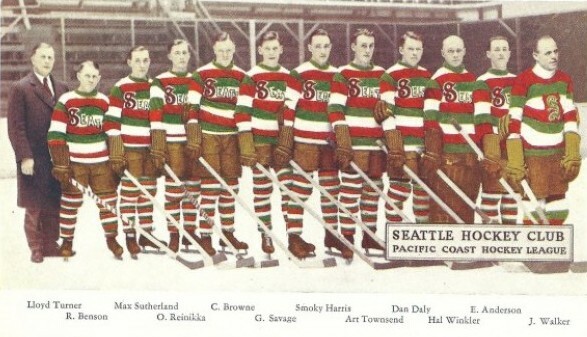 Since the 1917 Stanley Cup champion Metropolitans folded in the mid-1920s, Seattle has had five opportunities to return to the top tier of professional hockey. Editor’s note: The potential arrival of a National Hockey League franchise in 2020 in a renovated Seattle Center arena prompted Sportspress Northwest to present a series revisiting the sport’s Seattle history from previously published Wayback Machine stories. This is the final of the six-part series. If all goes well with Oak View Group’s extraordinary plan to provide more than $600 million in private money to renovate Key Arena, fans in 2020 will welcome the National Hockey League to Seattle, culminating a century-long odyssey. 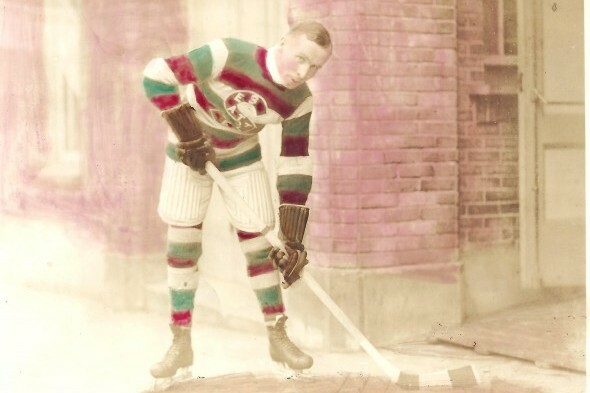 It began in 1914, when the Patrick brothers, Lester and Frank, made the city part of the newly formed Pacific Coast Hockey Association with their creation of the Metropolitans. Deposits on season tickets for the prospective expansion franchise will be taken starting at 10 a.m. Thursday at NHLSeattle.com. To kick things off, arena developer Tim Leiweke and Hollywood filmmaker and potential co-owner Jerry Bruckheimer will have a media event at the Space Needle, which towers over the Seattle Center grounds, the neighborhood where the sport had some of its best years. The PCHA, which also included franchises in Vancouver, Victoria and Portland, rapidly developed into such a serious rival to the established National Hockey Association, forerunner of the National Hockey League, that the regular-season champions of each circuit agreed to square off in the postseason, Lord Stanley’s Cup going to the winner. Seattle took the Cup in 1917 in a rousing series at the downtown Ice Arena (capacity 2,500) and played for it three times in a four-year span. That’s as close as Seattle made it to top-tier hockey until the late 1970s when lawyer Vince Abbey, co-owner of the Western Hockey League Totems, nearly landed an NHL franchise. It took another 20 years after Abbey’s failure to procure a team for Seattle to receive another shot. But billboard baron Barry Ackerley, owner of the NBA’s SuperSonics, torpedoed that chance with his bizarre actions at a 1990 meeting with the NHL’s Board of Governors. The subsequent 1995 remodel of the city-owned KeyArena was done for basketball only, the floor plan insufficient to host the needs of the NHL. No NHL ownership group seriously considered the Seattle market again until prospective purchasers of the Phoenix Coyotes were threatened in 2013 with a loss of their lease. A couple of New York financiers indicated interest in buying the team and relocating the franchise to Seattle if the Glendale, AZ., City Council failed to approve a lease heavily weighted in favor of the club. But by a 4-3 margin, the council approved the deal that kept the Coyotes in the desert and iced Seattle’s chances yet again. By our count, the Coyotes represented the fifth missed opportunity to do so. As Jeff Obermeyer, author of Emerald Ice, wrote in his excellent local history of the sport at seattlehockey.net, more than 1,000 players have suited up for various Seattle teams over the years, from the Cup champion Metropolitans to the current Western Hockey League’s junior-level Thunderbirds now playing in Kent. More than 250 played one or more games in the NHL, eight earning induction into the Hockey Hall of Fame. 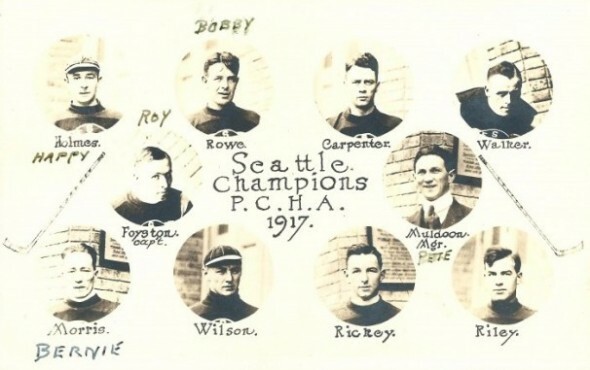 The Metropolitans employed four of the eight – Frank Foyston, Harry “Hap” Holmes, Lester Patrick and Jack Walker, who also had a stint with the short-lived Seattle Eskimos. But the Metropolitans lasted only until 1924, when they folded due to post-championship apathy (a year after they folded, the Ice Arena was converted into a parking garage). The Mets’ former coach, Pete Muldoon, helped revive the sport professionally in Seattle in 1928 with the introduction of the Seattle Eskimos of the new Pacific Coast Hockey League, but the PCHL struggled until 1931 and went out of business. 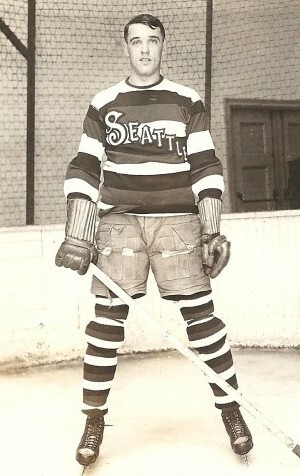 The Northwest Hockey League (NWHL) took the PCHL’s place in 1933-34, the Sea Hawks representing Seattle. By 1940-41, the Sea Hawks had morphed into the Olympics, sent off financially largely by World War II. 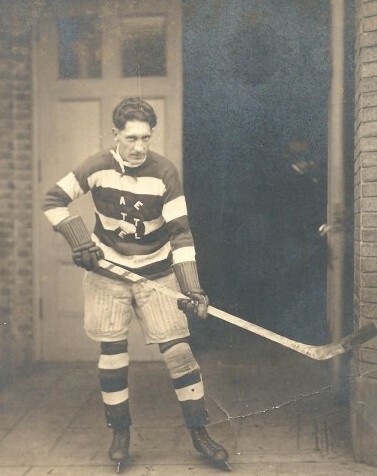 Immediately after the war, Seattle placed two entries in the new Pacific Hockey League, the Isaacson Ironmen and Sick’s Stars, the latter sponsored by Rainiers owner Emil Sick. The Stars ultimately disbanded. 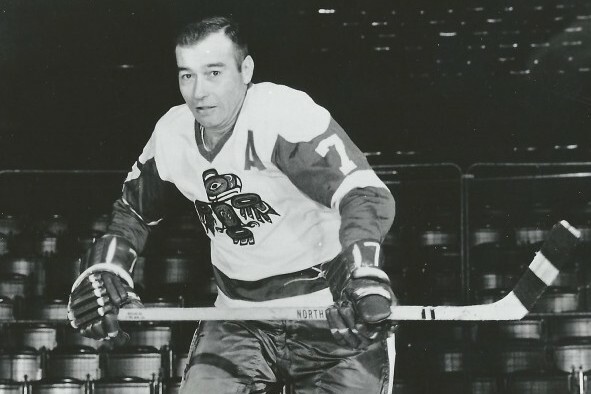 The Ironmen, for whom Fred Shero, future Hall of Famer and coach of Philadelphia’s “Broad Street Bullies” played, became the Bombers (1952-54). The Bombers begat the Americans (1955-58), who begat the Totems (1958-75), the latter giving Seattle its second great era of hockey and first since Muldoon’s Mets. 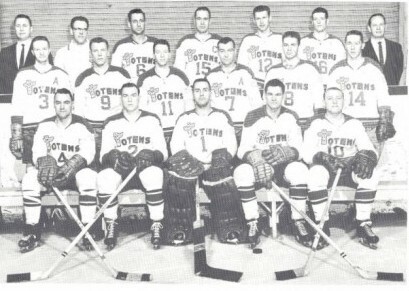 The Totems played in five Western Hockey League finals, winning three championships, and five times featured the league’s MVP (Guyle Fielder four times, Bill MacFarland once). The Totems’ attendance figures typically rose and fell in direct proportion to the club’s performance on the ice (see Wayback Machine: Guyle Fielder & The Seattle Totems and Bill MacFarland & The Totems). For a good part of their run, the Totems flourished financially. But by the end of the 1971-72 season, the glory years gone, owners Abbey and Eldred Barnes found themselves upside down financially and had little recourse but to sell a majority interest to Northwest Sports, owners of the Vancouver Canucks, in order to keep the doors open. As part of their agreement, Abbey and Barnes received the right to re-purchase the Totems from the Canucks should Seattle be offered an NHL franchise. Up to that point, Seattle had never been offered one. The NHL did not want to place a franchise – existing or expansion – in a minor league market, which Seattle remained until 1966-67 when the NBA expanded to Seattle. 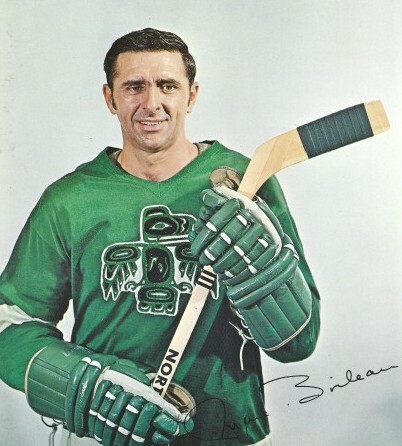 But the NHL became extremely interested in Seattle after the SuperSonics and MLB Pilots (1969) arrived, and especially after the World Hockey Association squalled into existence in 1972. Suddenly Seattle was a coveted site for both leagues. The question: Which league would win the race to Seattle? As the Totems struggled through 26-32-14 and 32-42-4 seasons in 1972-73 and 1973-74, Abbey assembled a new ownership group and launched efforts to acquire an NHL franchise. He finally rang the bell June 12, 1974. The NHL announced Abbey’s group had been awarded an expansion team to begin play in the 1976-77 season. As a condition, a reasonable one, the NHL mandated that Abbey (and his partners) make a $180,000 deposit on the franchise by the end of 1975. The total franchise fee would amount to approximately $6 million. In addition, the NHL declared that Abbey had to repurchase the shares in the Totems held by the Canucks, who were using the Totems as a farm club, and had lent the Totems money to be used as operating capital, about $400,000. The NHL’s expansion announcement also included a franchise for Denver. With the loss of two of its major markets, the Western Hockey League announced that it would fold, forcing the Totems to join the Central Hockey League for 1974-75 before formally entering the NHL. Elated Seattle hockey fans had no idea of the underlying snafu: Abbey did not have sufficient funds to repurchase the shares he sold to the Canucks, or make the $180,000 expansion deposit to the NHL. Abbey missed several NHL-imposed deadlines while scrambling to secure financing. With each miss, the NHL threatened to pull the franchise, claiming that it had any number of other suitors in the wings. During this time, Abbey passed on an opportunity to purchase a WHA team for $2 million, and also missed a chance to acquire an existing franchise when the Pittsburgh Penguins were sold in a bankruptcy proceeding for $4.4 million in June 1975. Abbey finally had to fold the Totems, at which point the NHL pulled the expansion franchise from Seattle, leaving the city without hockey for the first time in two decades (Denver also lost its franchise after one year of operation). Although Abbey failed to come with the money, he filed suit against the NHL and the Canucks for anti-trust violations that he alleged prevented him from acquiring a team. Abbey’s lawsuits clogged the courts until 1986 when the Ninth Circuit Court of Appeals tossed out his claims. That seemed to squash Seattle’s chances of ever receiving another franchise — until the NHL announced a new round of expansion for the 1992-93 season. Two groups in Seattle surfaced as potential owners, one headed by Bill Ackerley, son of the Sonics owner, the other by Microsoft executive Chris Larson. Ultimately, the camps joined forces. In the fall of 1990, Larson and former Totems star and coach Bill MacFarland met with the NHL’s board of directors. The hockey suits became enthralled at the prospect of welcoming a Microsoft millionaire into the flock. On Dec. 5, MacFarland, Larson, Barry Ackerley and Bill Lear, an Ackerley financial advisor, traveled to West Palm Beach, FL., to meet the NHL’s Board of Governors at the Breakers Hotel. Considered a lock to land a franchise, the Seattle contingent did not even receive a full hearing because Barry Ackerley mysteriously pulled Seattle’s application without acknowledging Larson or McFarland, or even giving any reason. Bill Ackerley also admitted – and denied – a lot of things in the aftermath of one of the major mixups/mishaps in Seattle’s pro sports history. Although the NHL had set a $50 million minimum price tag for an expansion franchise, Larson figured that a $35 million offer would get him in the door and provide him a chance to negotiate. What neither Larson nor MacFarland knew was that while they had gone to Florida to file a formal application for a team, Acklerley had gone there to withdraw it. Incredibly, none of this came up when the Seattle group convened in strategy sessions prior to meeting with the NHL. MacFarland, Ackerley and Lear had dinner the night before the meeting and the subject of the application did not arise. Joined by Larson, they all had breakfast on the morning of the meeting. Ackerley never said a word about pulling the application. “I mean, we were there thinking we were going to be working with these people to bring the NHL to Seattle,” MacFarland told the Post-Intelligencer. 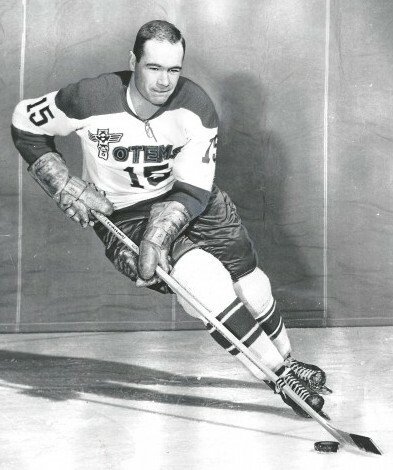 MacFarland later told The News Tribune (Tacoma) that the four of them were sitting in a room waiting to speak to NHL executives when then-NHL president John Ziegler stuck his head in and informed them they were next on the docket. At that point, according to MacFarland, Ackerley asked his “allies” if he could address NHL officials by himself before the group as a whole met league officials. When Ackerley confronted NHL owners, he formally withdrew the application while MacFarland and Larson waited in the other room, oblivious to what Ackerley had done. Ackerley never did – at least adequately – explain his odd action. He simply departed the hotel via a side door and flew back to Seattle without a word to MacFarland or Larson. A few minutes after Ackerley vamoosed, NHL official Gil Stein informed MacFarland and Larson that the expansion application had been pulled and that Ackerley had left the building. “We were floored; we couldn’t believe it,” MacFarland told the P-I. If so, why didn’t Ackerley inform Larson and MacFarland of his intention to pull the franchise at dinner or breakfast? And why were Larson and MacFarland in Florida at all if Ackerley didn’t think Larson had enough money to acquire a franchise? Less than two years later, Larson would become a 27 percent owner of the Mariners, the largest U.S. owner behind the 55 percent of Hiroshi Yamauchi of Japan, who helped purchase the MLB team from Jeff Smulyan for $125 million. Ackerley never offered a plausible explanation. He claimed he had been unaware that Larson was prepared to spend at least $35 million, and $50 million if necessary. He said he was under the impression Larson had only $10 million to invest. He never explained where he came by that notion, saying he was surprised Larson and MacFarland traveled to Florida in the first place. In the end, Ackerley blamed the loss of an NHL franchise on a “miscommunication” (“For want of a nail, the shoe was lost . . .”). MacFarland always believed Ackerley never wanted an NHL franchise that would have competed for arena dates and advertising dollars with the Sonics team he owned in the same building (Coliseum, later KeyArena), and that he wanted only to control the application process to ensure that. Half a decade later, in 1995, MacFarland’s opinion became reality when a $100 million transformation of the Seattle Coliseum into the 17,000-seat KeyArena provided no adequate configuration – just 11,000 unrestricted view seats — for NHL hockey. But Ackerley sold the Sonics in 2000 to Starbucks owner Howard Schultz, who began complaining immediately about the arena’s lack of revenues despite the recent upgrade. Unwilling to fund much of the next cycle of improvements, Schultz in 2006 sold to a wealthy oil-and-gas cabal from Oklahoma City led by Clay Bennett. In 2008, Bennett, who lied about his desire to stay in Seattle, sued the city for breach of lease. The city council voted to accept a $45 million settlement that paid off the arena’s debt, but for the first time in 41 years, Seattle was without an NBA team after Bennett moved the Sonics to his hometown. Now, winter-sports widow Seattle has a new/old suitor — pro hockey. Armed with a memorandum of understanding signed in December with the city and backed by a sports-crazy mayor, Jenny Durkan, Leiweke’s Oak View Group of Los Angeles seeks to fund the entirety of the retrofit, while throwing additional money at traffic and parking mitigation in Seattle’s fastest-growing neighborhood. OVG has secured two partners, Bruckheimer and investment banker David Bonderman, to pay a $650 million expansion fee to own the prospective team. That’s up $150 million from the fee paid two years ago by the expansion Las Vegas Golden Knights, and up $649 million from what Vince Abbey was asked to pay in the 1970s. Hurdles, such as the state’s mandatory environmental review for the project, remain. And the embrace for a sport whose competitive peak was reached 101 years ago, is unknown. But the dreamy, big-time ambition that brothers Lester and Frank Patrick had for Seattle and ice is closer than it has ever been since. Great series – another excellent read. One note: Bonderman said this morning on 710 ESPN that he had a handshake agreement with the NHL in 2008 before the recession hit. I believe that was for a potential Seattle team. At that time, I’m not sure what options Bonderman had. The Key was inadequate for NHL, the Seattle sports world was three years from hearing about Chris Hansen, and the city had no options for public funding, especially in the wake of the yes vote in 2007 on I-91 that outraged the NBA. Could have been Seattle, though I read elsewhere that Las Vegas was his and Bruckheimer’s target at the time. They made it through the financial crisis okay, but their arena financiers/partners did not. And since Vegas didn’t have a proper arena (as defined by the NHL and NBA) at the time, the proposal ended there. I have two questions for Dave and Jerry. Since they don’t live here, do they know how challenging it is to get to Seattle Center for most folks? And, what is their ownership succession plan? I doubt they understand the unique aspects of Seattle’s traffic, and accept that Leiweke thinks he has a workaround. And ownership succession is a fair question without a public answer yet.